A metropolitan planning organization (MPO) is a federally mandated and federally funded transportation policy-making organization in the United States that is made up of representatives from local government and governmental transportation authorities. They were created to ensure regional cooperation in transportation planning. MPOs were introduced by the Federal-Aid Highway Act of 1962, which required the formation of an MPO for any urbanized area (UZA) with a population greater than 50,000. Federal funding for transportation projects and programs are channeled through this planning process. Congress created MPOs in order to ensure that existing and future expenditures of governmental funds for transportation projects and programs are based on a continuing, cooperative, and comprehensive (“3‑C”) planning process. Statewide and metropolitan transportation planning processes are governed by federal law (23 U.S.C. §§ 134–135). Transparency through public access to participation in the planning process and electronic publication of plans now is required by federal law. 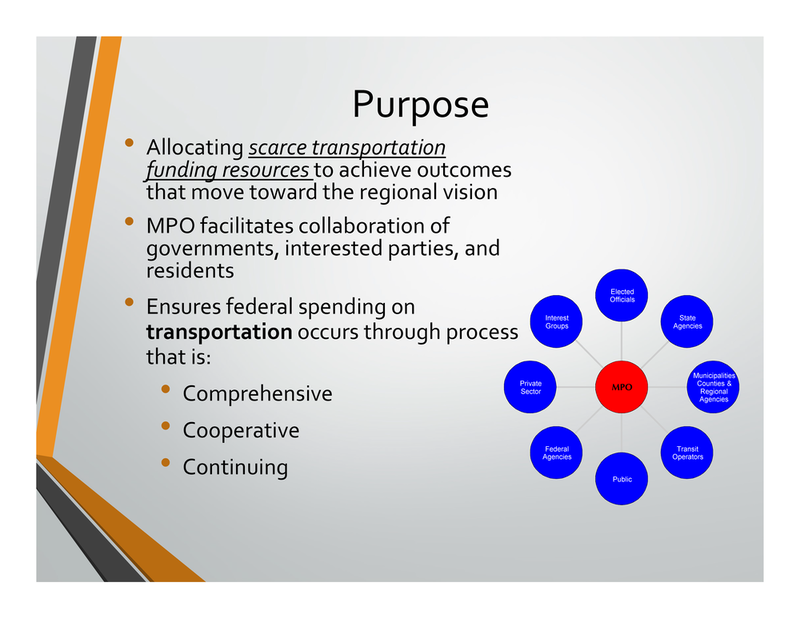 To put it briefly, the federal government requires that federal transportation funds be allocated to regions in a manner that has a basis in metropolitan plans developed through intergovernmental collaboration, rational analysis, and consensus-based decision making. The complete article can be found at Wikipedia, here. As of 2015, there are 408 MPOs in the United States. In addition, the map at left shows the 15 MPOs in Michigan, and the Metropolitan Statistical Areas in which they reside. In this way, MATS is a part of a larger group of Michigan and national MPOs, and is able to share information and best practices from many areas. More information can be found at the websites of the Michigan Transportation Planning Association, and the Association of Metropolitan Planning Organizations. Slide content courtesy of the Kalamazoo Area Transportation Study, edited for presentation.